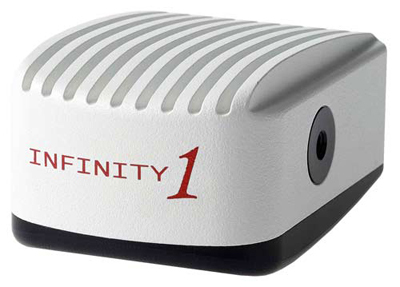 The Lumenera INFINITY 1-5C and 1-5M features a 3.1 MegaPixel Color/Monochrome scientific grade CMOS sensors to provide a cost effective and versatile solution for documenting and archiving microscope images. It is best suited for applications with moderate to high levels of available light (e.g. – Brightfield, reflected and transmitted microscopy).Note that the monochrome model has improved low light sensitivity due because it does not have the Bayer mosaic color overlay on the sensor.